We are excited to announce that our name has changed! Dental Care by the Square is now Washington Dental Care. Since our move to our new location at 1051 West Madison Street, our office is no longer located by the square which has prompted the new name. Washington Dental Care: Providing you with a memorable smile and the Best Dental Care for you and your family! 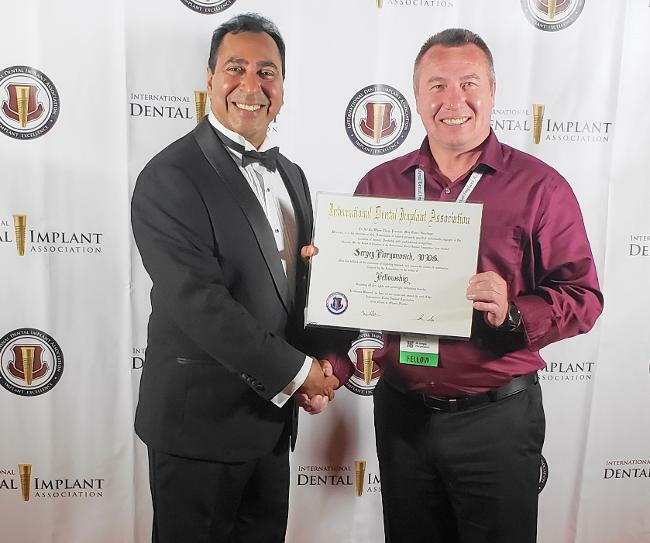 Congratulations Dr. Serge on your Fellowship with the International Dental Implant Association! Needing a Crown or Bridge? Want it the same day? Washington Dental Care is dedicated to providing the highest quality dental care for you and your family. We offer a warm, caring, family-like atmosphere and are conveniently located in Washington, Iowa. We look forward to meeting and exceeding your expectations when addressing your dental health needs. Whether it has been 6 months or years since your last dental visit, we are here to help. Dr. Floryanovich originates from the country of Belarus, in Eastern Europe. He and his wife, Anna, moved to the US in 1995 and settled in Spokane, Washington. Dr. Floryanovich, known to his patients as Dr. Serge, completed his Bachelor of Science degree majoring in Microbiology and minoring in Chemistry at Eastern Washington University near Spokane. He then graduated from one of the best dental schools in the country; the University of Iowa in 2008. During school, Dr. Floryanovich was awarded several honors including awards in Prosthodontics and Operative. After graduation, Dr. Floryanovich took over the practice of Dr. John Helscher, Dental Care by the Square upon Dr. Helscher's retirement. His wife, Anna, is an Emergency Medicine Physician in Iowa City, Iowa. Our staff is experienced, fun to work with, and completely professional. Our facility features state-of-the-art equipment and a comfortable atmosphere. We provide gentle dental care to our patients and treat you like family! Hope to see you soon!